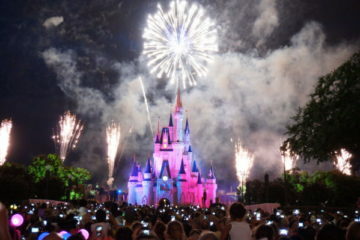 Quick-service dining at Disney World provides good food pretty quickly. They know how to get guests through a line and serve up quality food in a timely fashion. Even with very long lines, you can order, eat, and be on your way in 30-45 minutes unless you linger to look at a map or plan your next moves. But where do you go once you get your tray and toppings? Are there really no tables left in the restaurant? Do you have to resort to standing in the corner or near a trashcan? Probably not! 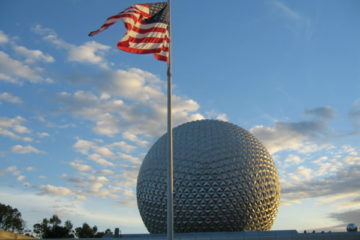 As with many other locations in Disney, people miss a lot of details because they don’t look up. Let’s look at three quick-service restaurants that have seemingly hidden seating that very few people know about. 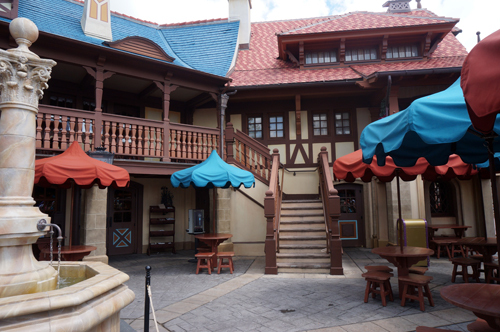 Pinocchio Village Haus is a great little restaurant in the middle of Fantasyland. This delightfully themed dining option offers delicious flatbreads, salads, subs, and chicken nuggets along with gelato and a variety of beverages. After you order your food and look around, you may be dismayed at the lack of tables available. This is a very popular spot, and it fills up quickly, but did you know that there’s an upstairs balcony? What if I told you there are two upstairs balconies? The interior balcony seating is small but provides neat views of the restaurant. There are both interior and exterior staircases to the upstairs balcony. Grab your tray, and then look to the left side and you’ll see a staircase. When you head up this staircase, you’ll find a large balcony overlooking the lower level. Even on very busy days, this area can be completely empty. 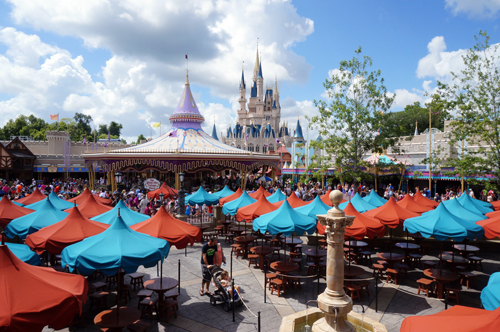 If you’d rather dine with a view, head to the outside balcony, which overlooks Fantasyland with views of Cinderella Castle. Exterior balcony seating is small but often overlooked as purely decoration, so you’re likely to find a seat here. The exterior balcony offers amazing views of Fantasyland and Cinderella Castle in the distance. 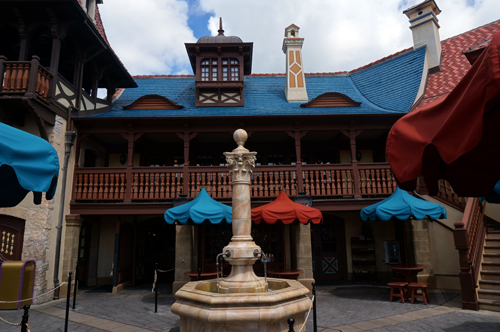 If you love seafood, head over to Liberty Square for American-style fish and chips (actually French Fries). If fish isn’t your thing, they also have chicken, salads, and a vegetarian option called Lighthouse Sandwich with hummus, tomato, and broccoli slaw. Couscous, New England Clam Chowder, coleslaw, and vegetarian chili are also available along with various kid’s meals and desserts. 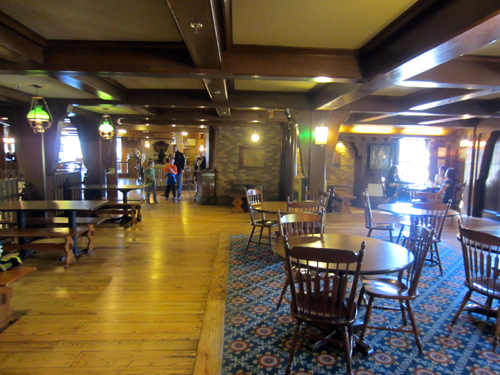 Most people aren’t aware that there is an upstairs of Columbia Harbour House, so this area is often almost empty. In addition to the variety of food choices, there is plenty of seating if you’re willing to look for it. There are two staircases. Both lead to an upstairs level with a very large dining area, but I suggest going to the left side. When you get to the top of the stairs, turn right and go to the back corner. This area is usually the last to fill up. This old-west style saloon has a delicious Chipotle-inspired menu that I highly recommend. 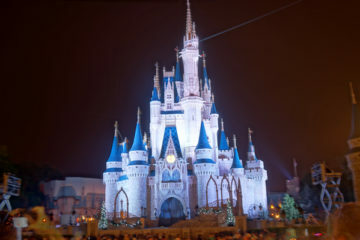 I eat at this location more than any other quick-service restaurant in Magic Kingdom, and I never get tired of it! 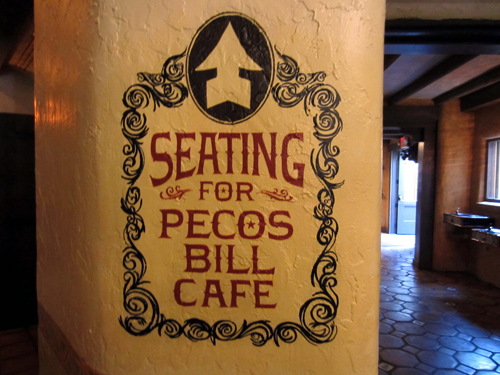 Pecos Bill has a lot of seating throughout the building if you look for it. 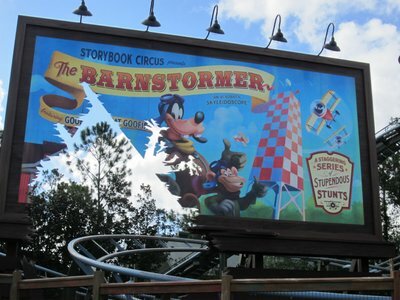 Pecos Bill is actually very large with plenty of seating, but many people overlook some areas. 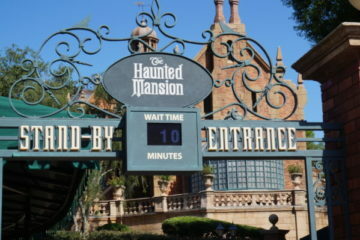 Head down the main hallway towards the exit to Adventureland. On the left side, you’ll see a ramp. If you head up this ramp, you’ll find the Jack Sparrow Room, which often has many open tables. Be sure to hit the toppings bar first, though, because it’s quite a long walk back if you forget something. 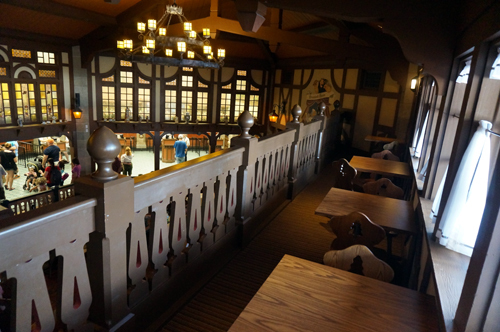 What is your favorite hidden dining area in the Magic Kingdom? 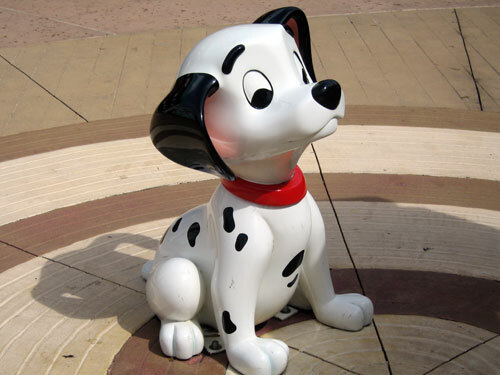 Take Your Dog to the Magic Kingdom? Now You Can!